Tall Tales: She "tri"-ed. She succeeded! If you've never been a spectator at a triathlon, marathon, or any race event, I highly encourage you to do so. I'm not sure there is anything more inspiring than watching athletes put their hearts, minds, and bodies into their race. I love standing at finish lines and watching the victories. And it's even better when you have someone to cheer for! 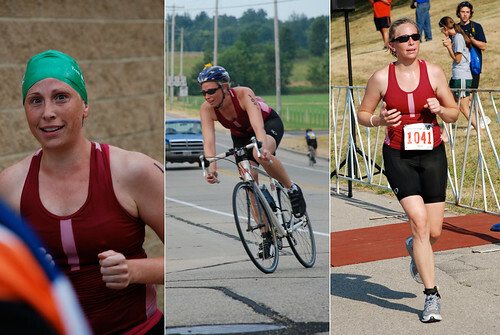 Erin, my sis-in-law, raced in the Verona Triathlon on Saturday morning. I admit, I grumbled a little when my alarm went off so early on a Saturday, but all I had to do was clap and cheer. Erin, on the other hand, woke up early to swim, bike, and run her way to the finish line. She did more before 9am than most of us do all day. Congrats on your great finish, Erin! It was fun to watch! 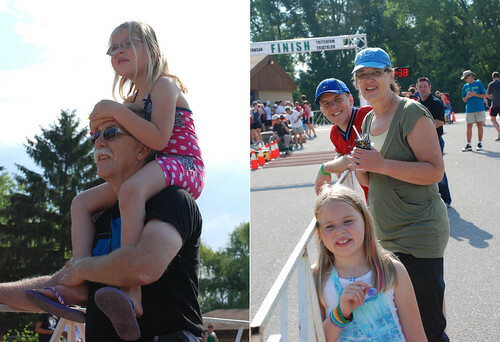 Did I mention that the Billmeyers make a great cheering section?